I added to my list of ’50 new things in 2010′ yesterday. I went to The Royal Easter Show for the day. Yes, I have done that before, but yesterday I attended in a very different capacity. I was helping to man (or woman, as the case may be) an exhibit at The Show. Lots of people came past , watched and asked me questions. If you were there yesterday, and in The Arts and Crafts Pavilion, you may have seen me on the Bernina stand, with some other enthusiasts, demonstrating patchwork techniques. It was lots of fun. People were very friendly as they noticed what we were doing, coming over to look more closely, both men and women. They would always make a comment, usually about how complicated it looked and remark about someone they knew who did patchwork. 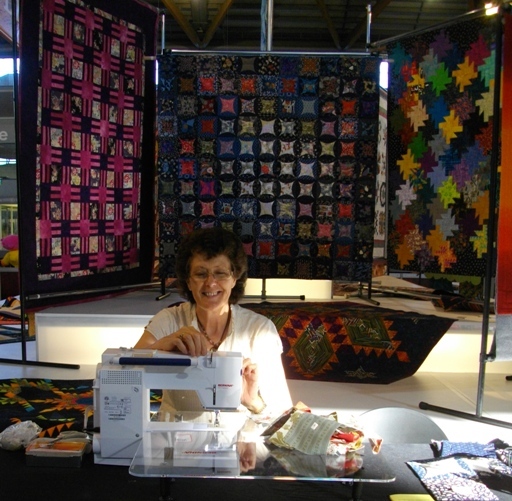 The Bernina stand was draped in a variety of colourful quilts from The Quilters Guild of NSW. Some of the quilts on display were Community Quilts, that were made by members of the Guild for charity. The quilts might be going to a child in hospital, to a teen in a refuge, or to a family whose house was destroyed in a fire. I love this charity aspect of patchwork that is shared the world over. Having gained something from the creative process involved in quilt making, these women overflow with a desire to use their craft to bring beauty into the lives of people in need. The quilts that were hung for display were owned by individuals who had put hours and hours, months and months, and sometimes years into producing them. They were works of art! I would have loved to answer “Yes” when asked “Did you make those quilts?” If only! I was happy just to be showcasing a traditional craft and putting it ‘out there’ for a wider, newer audience. One small step . .